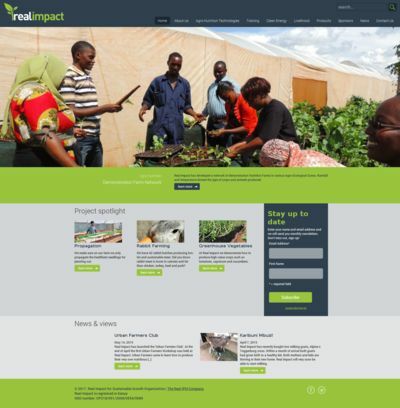 Real Impact is a Kenyan Non-Governmental Organisation (NGO) working to increase food security and improve nutritional health in East Africa. By delivering quality training to many communities we are bringing modern and sustainable agricultural practice and nutrition to the fore. Real Impact helps communities understand the principles of good nutrition. We train institutions, extension workers, other NGOs, community leaders and small scale farmers throughout Kenya. Our areas of expertise are agronomy and nutrition. We teach how to design and manage Nutrition Gardens and how to design nutritionally balanced menus, to be prepared using nutritious cooking techniques. We run capacity building training programmes for groups and extension workers and on simple agricultural technologies suitable for Small Scale Farmers. The NGO is based at Kichozi Farm in Thika, where it has a 2.5 hectare demonstration farm and a training kitchen. Real IPM Kenya Ltd hosts the NGO as part of its Corporate Social Responsibility programme.